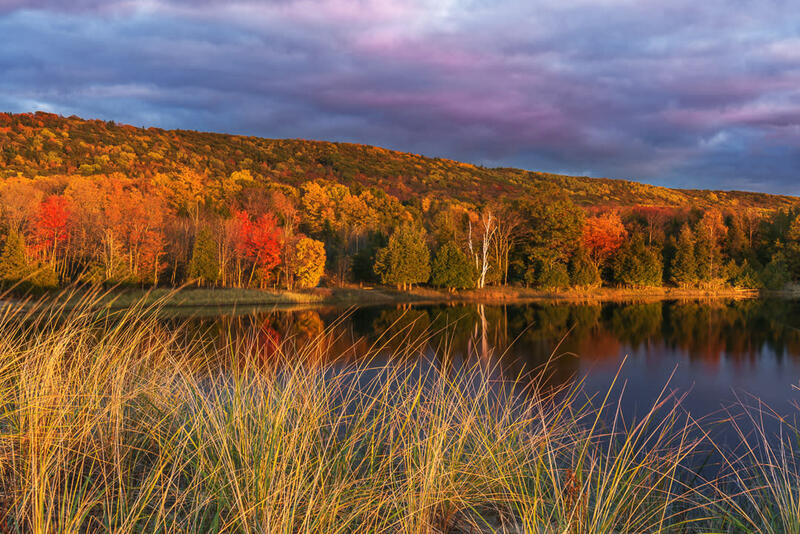 It&apos;s no secret The Sleeping Bear Dunes National Lakeshore is known for its year-round beauty. And when autumn arrives, the scenery is even further enhanced by nature&apos;s color palette. The large crowds of summer have faded, but this bear has not yet hibernated! Stop at an orchard for some cider and donuts (or you can always grab an apple for a healthier option! 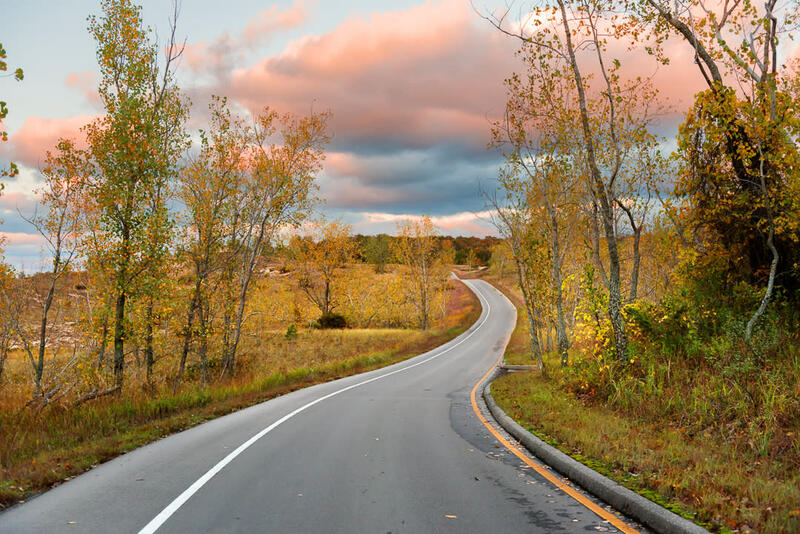 ), and hit the road to visit these scenic spots within the park. The Empire Bluff Trail is famous for its sweeping views of Lake Michigan. During the fall, the hills are covered with warm oranges and yellows, making a striking contrast against the lake&apos;s cool blues and greens. 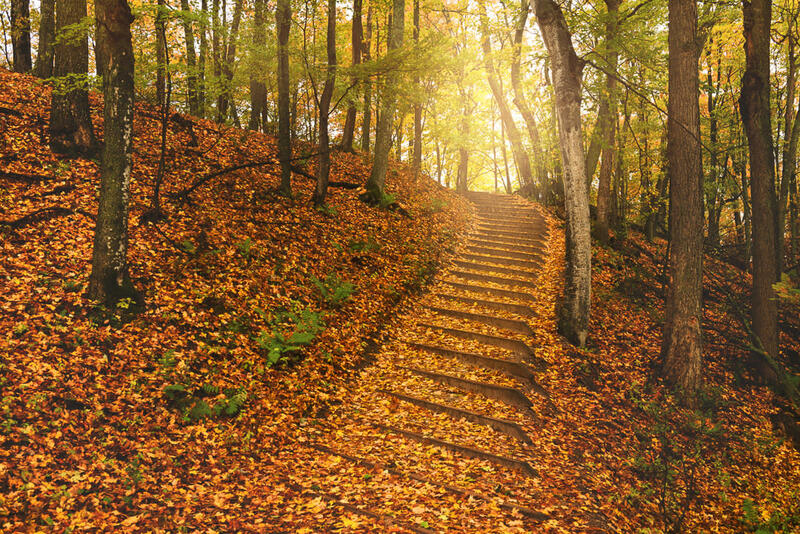 The overlooks are just as rewarding in autumn as they always are, but for us, the real beauty lies along the trail. The colorful blanket of leaves, the mythical canopy overhead and the climb to the scenic vista make for a stunning and rewarding experience. The emerald waters of North Bar are tucked behind a sand bluff, so they often make an ideal place for gazing at autumn&apos;s reflections. A stroll along the shoreline provides views of fall&apos;s kaleidoscope of colors that are inverted on the water&apos;s surface. If a hike is calling your name, head over the dune, where you will see the Empire Bluff against the crashing waves of Lake Michigan. 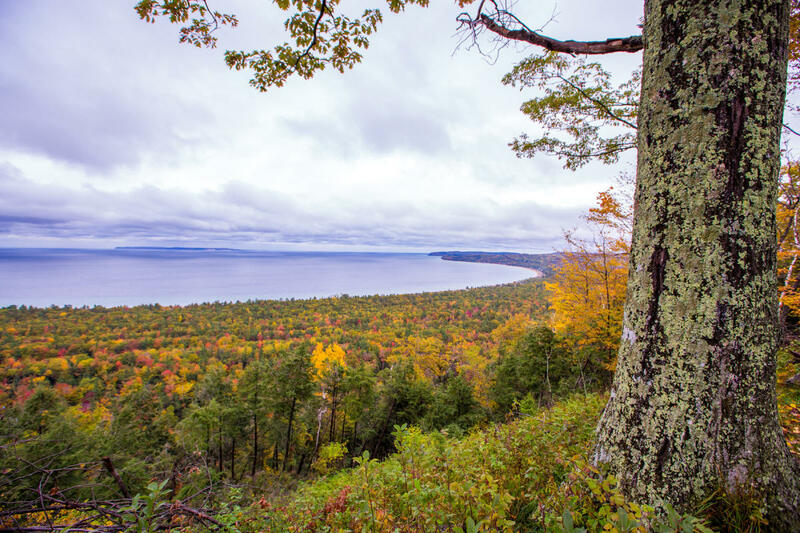 This winding 7.4 mile drive offers multiple vistas of Lake Michigan and several other inland lakes. Sunrise over the Glen Lakes is particularly pretty, while sunsets at the big #9 and #10 overlooks are unbeatable! The open dunes, mixed hardwood trees, a scenic covered bridge and ample lake views make it easy to see why this is one of the more popular routes in the park. Whereas the Empire Bluff hike is probably the most popular in the region, Alligator Hill is a relatively hidden gem. 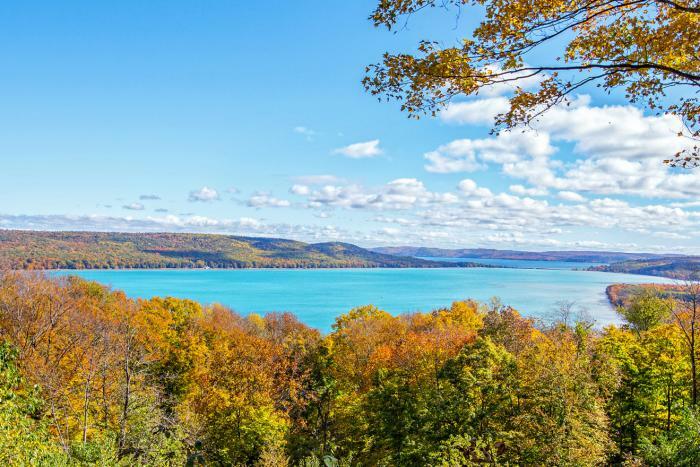 Located just behind the iconic DH Day Barns, this hike is more challenging than some of the more frequently visited trails in the Sleeping Bear Dunes. There are a total of nine miles of trails, but the main attraction -- the “islands lookout” -- is just under a mile and a half from the trail head. The view offers a panoramic vista of Sleeping Bear Bay stretching from Sleeping Bear Point, all the way up to Pyramid Point. There’s no better time to visit the rural historic district at the park. 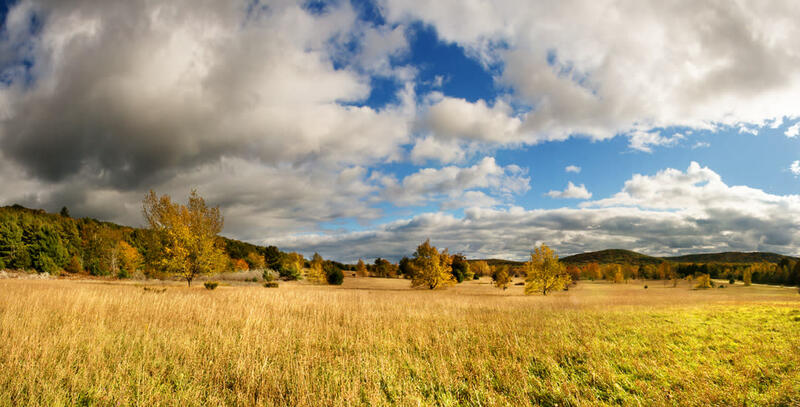 With the preserved farmhouses and barns, and remaining orchards, autumn gives one a feel of what harvest-time looked like a hundred years ago. Drive around the seasonal country roads and enjoy the vintage views. And if you are planning a family portrait session, this may just be your spot! Grand Traverse Living is a collaboration between Northern Way of Life Photography and Snap Happy Gal Photography. Working together, these local photographers curate a stunning collection of images showcasing the natural beauty and wonder of the Traverse City region. See more on Instagram or by checking out #GTLiving.